4 wins & 32 nominations. ...that this film is not getting the credit it deserves. It is in my opinion one of the most underrated films of all time along with The Matrix Reloaded. Revolutions is undoubtedly different from the previous films both in general and in terms of tone but why is that necessarily a bad thing? I won't be so arrogant as to say that the people who don't like this film are unintelligent. Whether or not people like a film or not is a subjective matter but I can't help feeling that the people who dislike (or even hate) this film are missing something because Revolutions is an intelligent, entertaining, beautiful, sad and moving picture. The acting of all three films have been a mixed bag and although I usually join in the bashing of Keanu Reeves I find him strangely fitting for the part of Neo. His voice is not the perfect voice due to its monotonous tone but his body language is very good and sometimes even great and that is the case in Revolutions as well. Carrie-Anne Moss plays her character like she did in film two and that is neither particularly good or bad but a decent performance. Laurence Fishbourne's character has been reduced somewhat for the final part of the series but I found that the lines he did have were delivered with conviction and experience. As most people know Gloria Foster died before finishing her scenes for Revolutions and thus a different actress was cast to take over. The choice fell on Mary Alice and while she is no where near as good as Foster she is decent enough. Ian Bliss gets a chance to show his worth in the third film and personally I found his scenes to be among the most interesting of the film and his uncanny imitation of Weaving was spot on. Most of the secondary cast from Reloaded returns in their parts in Revolutions and they all do decent jobs with their characters. Harry J. Lennix (Lock) improved his character tremendously in spite of limited screen time. Hugo Weaving still provides the best acting in the film and steals every one of his regrettably limited number of scenes. He is probably my all time favorite screen bad guy. He manages to show the change in his character remarkably well considering how limited his screen time is. Agent Smith exhibits an increasing amount of human traits including anger, hatred, jealousy and even a sly sense of humor. This change happens to mirror Neo's growing understanding of the machines. Neo and Smith are linked in that way as well. The effects are of course extraordinary which was to be expected after the stellar effects in the second film. Although there weren't as many scenes inside The Matrix this time around I still found the effects of the "real" world to be awe inspiring at the least and the battle for Zion was an incredible display of special effects. Of course the directors never lost sight of the people involved in the battle making it more tense had it only been effects. The climactic battle between Neo and Smith is quite simply stunning. It takes roughly 15 minutes and I for one hardly breathed in those 15 minutes. All three Matrix films have been inspired by Japanese animé comics and that is very visible in the final battle as one can't help but think of Dragonball for instance. The action in that particular scene is frighteningly well done and I got the chills when I watched it in the cinema. Very well done. The story is darker in this film than in either of the previous films but that is to be expected as the first film was about birth and the second about life. Obviously that means that the third is about the inevitable end that must come to us all: Death. This does that the tone of the film becomes much darker and I felt that was good. This did that the film distanced itself from the previous films in the series and rather than become another rerun the film becomes its own entirely and that is both its weakness and its strength. I think it is its strength as it increases the originality of the film but apparently a lot of people didn't like the interpretation that the third film represents as is clear from the bashing the film has gotten from audiences and critics alike. The film does still have great symbolic value and you can interpret the film in a great number of ways like the previous films. For me this improves the film(s) greatly as you can watch it again and again and still find new things that will renew your interest. Sadly I cannot make you love this film as much as I do because that would defeat the purpose of the film which is to make people think for themselves. My conclusion about Revolutions is that you will either love or you will hate it but in my opinion Revolutions is almost as good as the first one and one of the best films I have ever seen. 9/10 - On my top 10 of best films. 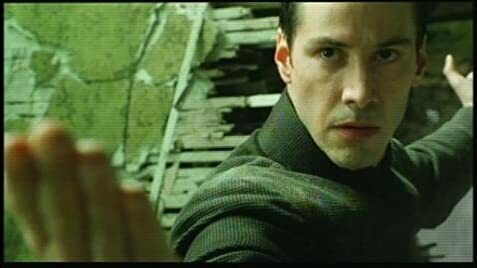 Many of the "raindrops" in the final fight between Neo and Smith are actually single lines of Matrix code, similar to those on displays seen in the "real world" throughout the trilogy. This subtle effect was added to imply the Matrix was beginning to destabilize. This visual trick was easily seen on IMAX and larger movie theaters, but can be seen on smaller televisions as banded rain that seems to "jump" like static during close-ups of the fight scenes. AK: I got nothing, sir. No sign of Niobe or Ghost. Nothin' but blue pills. When Trinity is shown dying, Neo bends over her and, in doing so, slightly moves her body which, in turn, moves the fake poles that are supposed to have gone through her body. There are no opening credits beyond the production logos and the title. When the film was released in theaters, the waste disposal machine shown at the end had red eyes but on the DVD release the eyes were changed to green. The making of documentary on the DVD still shows the machine with red eyes, obviously the documentary used older footage.